Seeing as its practically summer I had a random rainy day and fancied spending some time baking. As its been so warm and humid I thought I’d dig out an old favourite recipe and make a lemon cake! 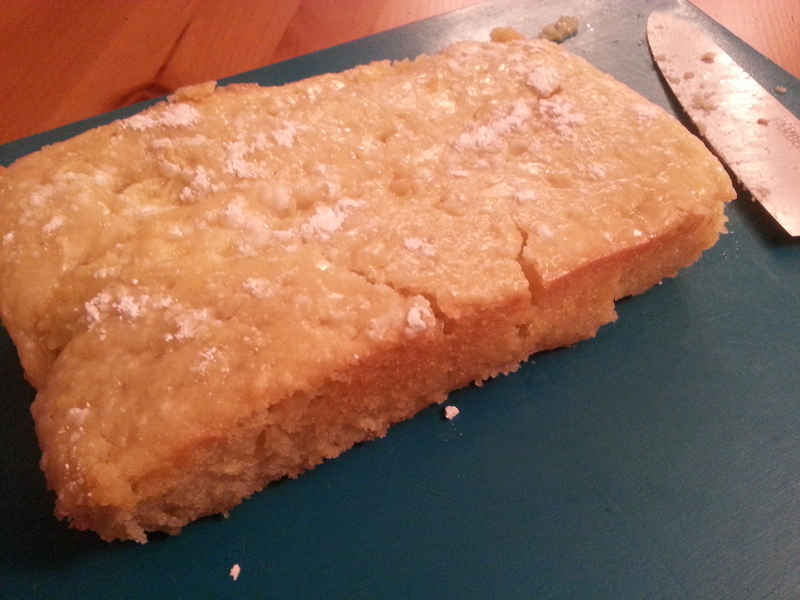 This one is a bit of a cross between a lemon drizzle cake and a gooey sponge cake. I’ve made it a few times before with different fruit, berries work well, as does apple, but lemon is still my favourite. You can’t really go wrong with lemon cake. Now this isn’t quite a proper lemon drizzle cake, its to moist, but its darn delicious, so if you fancy something refreshing give it a go. For the basic sponge you will need to beat together, 6oz butter, sugar, 2 eggs, drop of vanilla essence and 9oz of self raising flour. then between 80-100g of fruit, in this case lemons I use the flesh removing the skin, pith and pips, although if I fancy an extra bit of colour and flavour I grate the lemon rind in before I chop it up. I find lemon and lime also work well together. Once mixed place some mixture in a tin, sprinkle fruit on top and repeat until you have a few layers. Bake for about 1 hr on 160 degrees C, maybe more depending on your oven and tin size – longer for a loaf tin. When its still warm from the oven, I add the drizzle, 150g icing sugar, mixed with 2-4 table spoons of lemon juice. For an extra citrus kick, you can add in some more fruit flesh to the drizzle, mash together and pour on top.